Descripción: - 'Whois Online' monitors access to index or photo pages. Descripción: 'rightClick' plugin deactivates the context menu on websized pictures and more. The Picture page, 'akBookStyle', 'Lightbox' and 'HD Shadowbox' are protected by default. Other valid jQuery selectors could be added to the default list. By default, users with the "admin" privacy level can access the right-click menu. Context menus are disabled in main browsers. Please, remember that 'rightClick' is not a fully secured solution against image copying. Descripción: PiwigoPress is the one-stop solution for linking WordPress with your Piwigo photo album. 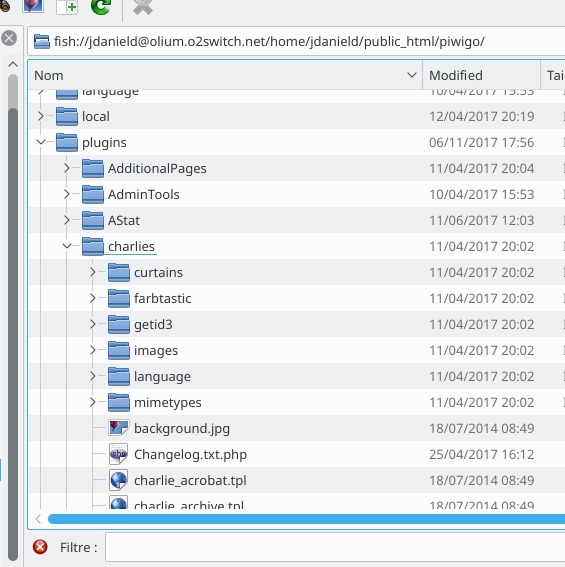 On the one hand, it provides a WordPress Sidebar Widget that links your blog to some public pictures of a Piwigo gallery. The widget also generates several highly valuable links in sidebars of your WordPress blog, all of them being optional: a thumbnail linking to the corresponding picture page, menus directing to all albums defined as public in the gallery, several additional links to most recent, most viewed, most commented pictures, and more. 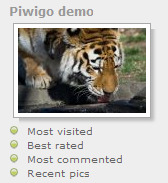 On the other hand, by using a shortcode [PiwigoPress ...] you can add any public picture of a Piwigo gallery. To facilitate writing of shortcodes, PiwigoPress provides a shortcode generator. Each time you add some pictures to your gallery you will be able to add a post related to your last uploaded photos. So, your friends and family are going to like your photos and Search Engines are going reference your gallery with the refbacks provided by PiwigoPress. Development of PiwigoPress is open to contributions, please use the github page (https://github.com/norbusan/piwigopress) for patches, bug reports, and issues.